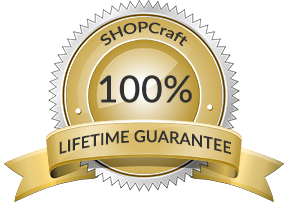 SHOPCraft products are covered by the Lifetime Guarantee. We stand by the products we manufacture. We want every customer to be a totally satisfied customer. Schaumburg Specialties LLC guarantees the SHOPCraft brand products manufactured by us to be free of defects in materials and workmanship for the entire LIFETIME of the product. • Schaumburg Specialties LLC guarantees SPACECraft and KWIKCraft brand products manufactured by us to be free from defects in materials and workmanship for a period of FIVE (5) years starting at the time of delivery. • Schaumburg Specialties LLC will repair or replace, at our discretion, any defective product covered by this warranty. • This warranty is void if the products are used for purposes outside the intended use. • Regular wear and tear, casters and/or wheels are excluded from this warrant. *This warranty does not apply if the products are used or have been used for purposes outside the products intended use. Regular wear and tear and consumable items are excluded, and casters and/or wheels are excluded from this guarantee, but are covered by our five year or one year warranty as applicable.